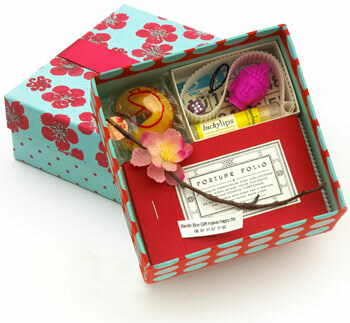 Bento Box Gifts is the go-to source for gifts that are uniquely packaged, turning a little thing into a special event. Inspired by a Japanese bento box lunch, with its little compartments of exquisitely presented food, a Bento Box Gift is a box full of the niftiest items, each nestled into its own compartment. Mimi Kolb, who has a background in advertising & graphic design, scours the world for neat little items that are sure to make the recipient feel special. The XXOO box is filled with big-hearted sentiments perfect for sweethearts & friends. Of course, this would make a great Valentine's Day gift! If you're looking for a memorable baby gift, there's a baby bento box that fits the bill. And who doesn't need an extra dose of good karma (pictured)? Bento Box Gifts are also available through The Shops @ Funky Finds. The Shops features limited-edition boxes available in selected boutiques, plus bestsellers from the main site. Thank you for featuring my boxes, Ms. Funky Finds! It's true, now that the Christmas ornaments are packed away (or not), we're all thinking about Valentine's Day! Heart this, as the saying goes. Supercute!